Can a bus teach children in Thailand how to fight dengue? How can a child be crucial in the fight against dengue? Sure they are one of the most dengue-affected groups, but kids are also valuable assets in spreading information about preventing the disease in their communities. This is because parents listen to them, especially in developing countries where they are often the first or second generation to receive an education. 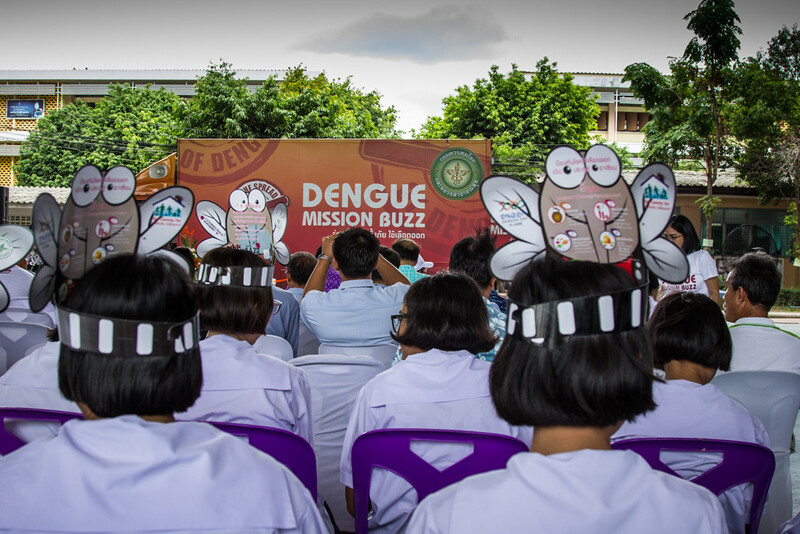 This is why the Dengue Mission Buzz, an awareness raising initiative launched by Sanofi Pasteur, is visiting schools throughout Thailand and other Asian countries to explain how to avoid the dengue mosquito’s bite. The first stop of this educational bus was Nakhon Pathom, a small city close to Bangkok in one of the provinces with the highest rates of dengue infections. “We have no problems at the school because we know how to prevent it. But the parents of some students are farmers and they don’t know how to do it,” says Samart Rodsumran, the principal at the Nakhon Pathom Wittayalai school, the largest in the province. “Children don’t normally think about prevention so we have to remind them often,” says Janngarm Chat,deputy director of the Provincial Health Office in Nakhon Pathom. According to the Ministry’s statistics, the most affected group in Thailand are children between 9 and 14. This is why it’s important to remind them to be careful. Because kids learn better by doing and playing, the bright orange Dengue Mission Buzz bus has a number of funny games that teach children how to fight the disease. “To prevent dengue, we have to avoid bites and put fish in the water ponds so they eat the mosquito larvae,” says 16 year-old Athinan, one of the students who attended the event. “We also have to use mosquito repellent if we play outside and avoid stagnant water at home,” says his classmate Piyaboot. The prevention tips are given to them in a colorful leaflet in the shape of a mosquito, which, funnily enough, they can also wear on their heads. The activities also include a speech on key aspects on prevention, a short concert, and a small contest with gifts for those who learned the most about dengue. The bus started its journey last June in Laos, during ASEAN Dengue day. It will travel to Malaysia, Indonesia, Thailand, Vietnam, and Philippines, to improve public understanding of the disease and its prevention. The bus will travel over 4,000 kilometers to more than 30 communities, reaching a population of about 50 million, according to Sanofi Pasteur.